Personalized Fanny Packs Custom Printed in Bulk. Inexpensive, Promotional, Lowest Price in USA, Canada. Black or Royal Blue. On Sale Today! Reduced 50% from our regular prices. 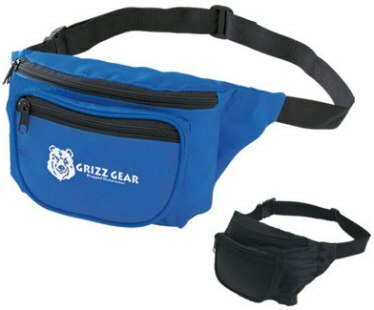 Economy Fanny Packs with 3 zippered pockets, custom imprinted with your logo. We also supply blank (not imprinted) wholesale fanny packs. Smaller sizes of wholesale personalized fanny packs are available: contact us. Budget Prices in the USA and Canada for wholesale fanny packs. Free artwork design. American clients pay no taxes. We will send you a proof for your approval before production.